What Makes a Piece of Evidence Inadmissible in Court? In any criminal case, evidence is a key part of the legal proceeding. Evidence is what the prosecution uses to link the defendant to the offense as well as what the criminal defense team uses to show that the defendant is innocent. Using evidence effectively is the key to convicting an individual or keeping him or her from conviction. But for a piece of evidence to be used this way, it must be admissible in court. You have certain civil rights and when evidence is obtained through violating these civil rights, that evidence is generally inadmissible in court. In most cases, this is because the evidence was obtained through an illegal search of the defendant’s home, person, or vehicle. Unless you consent to a search by law enforcement, the officer may not perform a search without a valid search warrant. You and your lawyer might need to demonstrate to the court why a piece of evidence is irrelevant because the prosecution might feel differently about it. 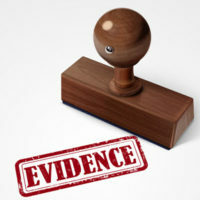 In addition to being material and legally obtained, admissible evidence is any evidence that is relevant to the case, meaning that is provides reasonable inferences about the case. When a piece of evidence is deemed to be irrelevant to a case, it may be thrown out. Learned treatises used to question expert witnesses. In 1975, the current Federal Rules of Evidence were passed by Congress. These rules govern the validity of various types of evidence that may be presented to the court, the role of witnesses in a legal case, privileges afforded to individuals in certain positions, and how hearsay is to be handled by the court. Florida also has its own set of rules regarding the use of evidence in criminal cases. Whether state or federal level rules apply to your case depend on whether your case is being handled by the state-level or federal court. Building your legal defense strategy will involve obtaining and using evidence. It might also involve moving to have inadmissible evidence suppressed. To learn more about developing an effective defense strategy for your case, contact our team of experienced Miami criminal defense lawyers at Ratzan & Faccidomo, LLC today to set up your initial consultation in our office.